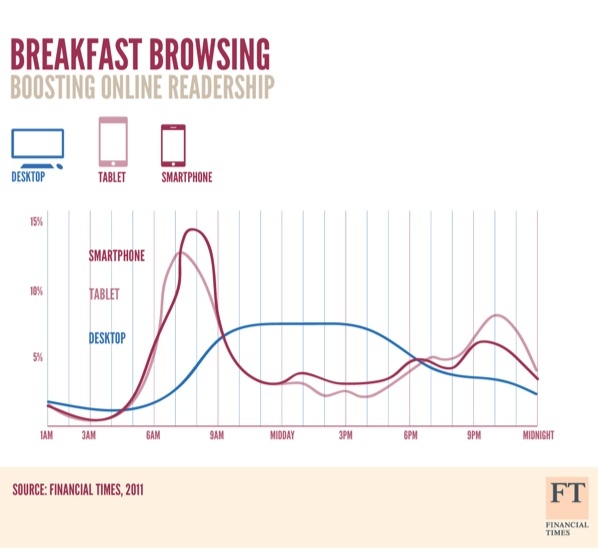 Well, peak reading time for smartphones and tablets is definitely over breakfast or during the commute. In contrast, desktop readership is mostly during the working day. However, it stays surprisingly high overnight – insomniacs, or have they included non-UK readers in these stats? Most intriguingly, the morning tablet peak is earlier and the evening peak later than for smartphones. I can think of two plausible theories: either tablet users sleep less (possible but unlikely) or people are taking their iPads to bed with them. What’s the modern etiquette on that one – is it okay to take your tablet but not smartphone to bed? Would be interesting to know what the reading material was. When I first got a smartphone, I found I spent a lot more evening and bed-time reading on it… but it did rather depend where I was. Time spent in evenings waiting for buses and trains – read on the phone. Certainly, in places I’d feel self-conscious using a tablet. However, if I was reading a ‘report’ for the following day, I’d probably want a tablet… but I’d also hope I’d be disciplined enough to quit work early enough in the night so I can get to sleep! Yes, they don’t release data but I think you’re probably right that people read different types (lengths) of articles on phones vs tablets. Maybe people are using their phones to check stock prices, but reading long-form more on the tablet? Also, tablets are a bit less practical and people with them more muggable so I guess they’re used less on the bus or tube than a smartphone, which is totally normal nowadays.